Usually missing teeth are replaced by bridges, partial dentures or complete dentures. Bridges utilize support from adjacent teeth, thus compromising them in the long run. The conventional dentures given after loss of teeth are not tight enough and may compromise the chewing efficiency and also the health of the individual. At times loose dentures may be a cause for social embrassment. Usually missing teeth are replaced by bridges, partial dentures or complete dentures. Bridges utilize support from adjacent teeth, thus compromising them in the long run. The conventional dentures given after loss of teeth are not tight enough and may compromise the chewing efficiency and also the health of the individual. At times loose dentures may be a cause for social embrassment. 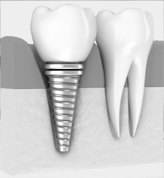 An implant is a metalic screw made of titanium which is inserted into the jaw bone to anchor the missing tooth or your denture permanently to the jaw bone. Anyone in a good health of any age group and wants to replace missing teeth. You must have enough bone in the area of the missing teeth to provide for the anchorage of the implants. Aesthetic----Dental implants look and feel like your own teeth! Since dental implants integrate into the structure of your bone, they prevent the bone loss and gum recession that often accompany bridgework and dentures. No one will ever know that you have a replacement tooth. Tooth Saving----Dental implants don't sacrifice the quality of your adjacent teeth like a bridge does because neighboring teeth are not altered to support the implant. More of your own teeth are left untouched, a significant long-term benefit to your oral health! Confidence----Dental implants will allow you to once again speak and eat with comfort and confidence! They are secure and offer freedom from the irksome clicks and wobbles of dentures. They'll allow you to say goodbye to worries about misplaced dentures and messy pastes and glues. What is the success rate of the dental implant? Implants are very successful! In healthy individuals, the success rate is about 95% to 99%. Smoking, uncontrolled diabetes or other major medical problems will reduce the chances of integration and success. Having assessed the quality and quantity of the underlying bone, the faciomaxillary surgeon will place the implant into your jaws. This surgical procedure is usually done under local anaesthesia. The healing time of about 3 to 6 months is then given to allow the implant to integrate with your bone. In the third stage, the Prosthodontist will fix the crown or your denture to the implant. Does it hurt to have implants placed? NO, usually implants are placed under local anaesthesia and the actual surgical procedure is not at all painful. After the local anaesthesia effect wears out there might be slight discomfort which is managed by simple pain killer tablets. It is very important to keep your implants clean. Strict cleaning procedures by a special brush or floss should be done regularly. Periodic cleaning by your dentist atleast once in 3 months is recommended. What implants can do for you?